Flying Blind, LLC is pleased to offer One Freedom Scientific Ruby Handheld Video Magnifier that has seen little to no use for $445.00 USD! This unit is still under its original manufacturer’s warranty until December of 2016. 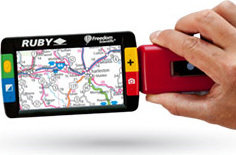 The Ruby Handheld Video Magnifier is small and lightweight enough to fit into a pocket or purse, yet provides the magnification you need to help you read or see details, whether you are at home or on the go. The 4.3-inch, full color, bright screen makes it outstanding for reading bills, letters, checks, and receipts. The Ruby is easy to use, with large buttons that are easy to see and feel. Price includes shipping within the 48 Continental United States, providing an approximate savings of $125.00 USD to one lucky buyer! To be the first to purchase this practically brand new handheld video magnifier at this fantastic discount, please use the Buy Now button below. For questions, or to purchase this unit offline, email [email protected] or call +1 (216) 381-8107 today! Savings: Offered here at approximately $125.00 USD off its suggested list price. This article excerpt was sourced from the website Top Tech TidBits Blindness technology news (full copy) and the original article can be found at Top Tech Tidbits for Thursday, April 14, 2016 - Volume 556.